This is Anna. Conner got two bunnies for his birthday, One needed a friend so that's how we ended up with two! My camera is still not loading my precious pics, so I took some more. I only got pictures of Anna though. We only have one leash, yes I bet you did not know you could walk a bunny did you? So any way I will take new pics of Theodore later. Anna is a cute little thing, and Taylor's buddy. She loves me of course, I am the one who makes sure she is taken care of. I caught this sweet pic of her meeting the dog. 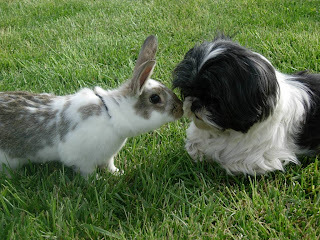 At first The dogs would just chase them, of course, but after making the dog sit, the bunny actually came up to the dog to check her out. I think the dog was soooo scared she came up to her that she just froze. Intimidation. It was funny cause the first day we had them I brought them in the house because it was raining and Brandon was trying to put a roof over their cage, anyway, we were playing with them on the floor and Brandon came in he said " has the cat seen the bunnies yet?" I said no, and just as I did, the cat came walking around the corner, he only comes in to get his food at night, and as soon as he saw that bunny take a hop, he crouched and sprinted. 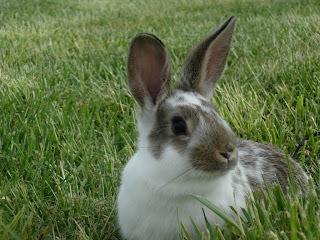 Brandon chased the cat, I caught the bunny, and the kids almost saw the cat have bunny for dinner! It was traumatic for me. I had no idea the cat would try to catch the bunny, but then again i do forget he is a farm cat, and a good one. We don't bring the bunnies in anymore in fear that the cat might waltz in unnoticed and seize his lunch. The bunnies are getting so big now, and they eat like humans, a lot. I am constantly feeding them. 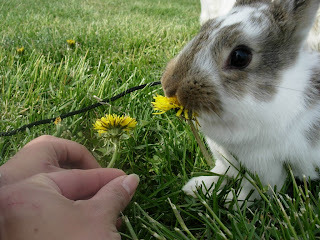 They are cute though, and little Anna likes to eat my Dandylions out of my lawn, so a plus for me. Thanks for the hairspray - I LOVE THE SMELL!!! !